The Scottish Clinical Research Excellence Development Scheme (SCREDS) is operated by Scottish Universities in partnership with the NHS Eudcation for Scotland (NES). For more info, please consult the SCREDS website. SCREDS Clinical Lecturer posts are registrar grade posts which offer academic training opportunities in addition to clinical training. The usual time allocation is 80% clinical training and 20% research training over the full period of the post. 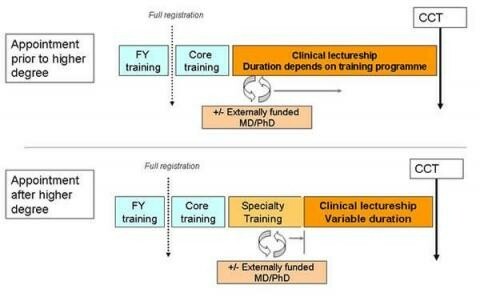 During the clinical lectureship, the research programme may be either focused on preparation for competitive entry to out-of-programme research (i.e. pre MD or PhD), or focussed on developing an area of research identified during a period of out of programme rsearch. To be eligibile for a SCREDS Clinical Lecturer post, you need to hold a National Training Number in that discipline. Applications for Clinical Lecturer posts in any speciality or research area (including general practice) at the University of Dundee are advertised in the BMJ. There is no fixed timetable for advertisement of these appointments. Appointments are made by the University of Dundee jointly with the NHS Tayside. They are supported by University contracts, and honorary NHS contracts.